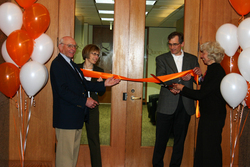 On May 12, Quorum Review IRB held a ribbon cutting ceremony to celebrate its expansion into new office space in the Century Square building in downtown Seattle, Washington. Quorum already occupies several floors of office space downtown Seattle, maintains an office in Vancouver, B.C., supports a number of employees on the East Coast and in the Midwest and has IRB members located across Canada and the U.S.. This most recent expansion highlights Quorum’s commitment to providing in-depth ethics review as well as world-class service. Quorum’s new location provides the infrastructure needed to support Quorum’s national and international ethics reviews. The office also is centrally located to the expertise of the research community of Seattle’s academic medical centers, research institutions, biotech companies and medical centers. Quorum’s best-in-class service and support includes 3 protocol board meetings a week, daily amendment board meetings, 24 hour site review, 36 hour amendment review, and a secure OnQ™ web portal for online submissions, downloads and submission status review. Quorum can review studies in the US and Canada, review federally funded studies and has a specially designated Phase I study management team. For information about Quorum Review services, see Quorum's website at http://www.quorumreview.com.